Hi my lovely Friends! This weeks nail polish is the 345 nail polish from the MNY Maybelline New York Collection. Like I said it on the top, it's a shimmery orange-red color. In the bottle it looks a bit more red, but if you put it on your nails it looks more orangy. I really like this colour because I think it's perfect for summer. 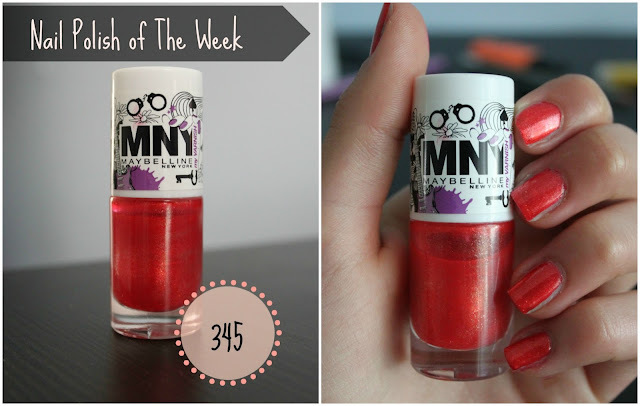 I own another nail polish from the MNY collection - the 135. And both colours are absolutely amazing! What's your favorite shimmer nail polish? Tell me below!